About a month ago, I decided I wanted to make some comfort food for my Meatout Mondays blog post at No Sweat, York. 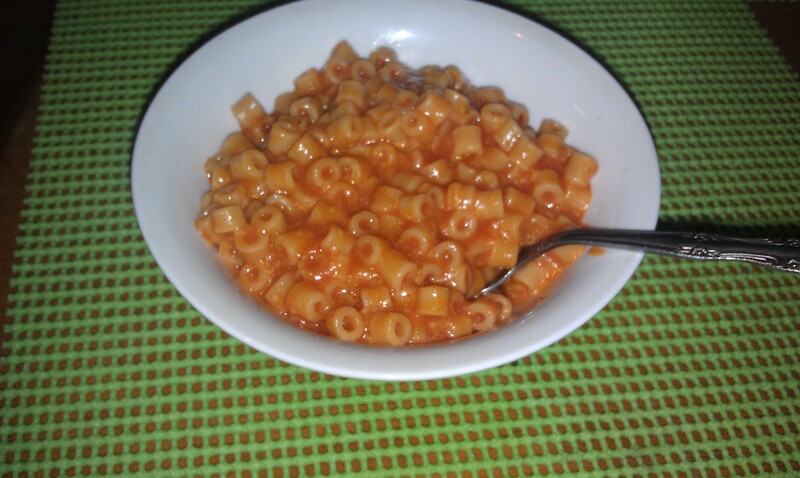 When I was a little girl, I LOVED SpaghettiOs. A big bowl of SpaghettiOs brings back memories of days spent with the Nana and Pop, where I watched Disney Channel (we didn’t have it at home) and play Chinese checkers. Being vegan, I don’t get SpaghettiOs that often anymore, unless I figure out a way to make them myself. Well, I did! Jamieson even liked the recipe, saying the dish tasted authentic. I adapted this recipe by Nikki at Seeded at the Table. Which of you vegans are hankering for SpaghettiOs? I know I am! I thought this dish was super easy to make, about 30 minutes or so. Make it for dinner and take leftovers for lunch tomorrow. I know your coworkers will be jealous of your homemade and healthier dish than the canned version of youth. Cook the pasta in a large pot of salted boiling water, to al dente (about 10 minutes). Drain and place pasta back into large pot. Meanwhile, heat the olive oil in a large saute pan over medium heat. Add the garlic powder and red pepper flakes and cook until just fragrant, about 30 seconds. Stir in the tomato sauce, water, tomato paste, salt, pepper, sugar and vegan butter. Heat, while stirring, until the butter is melted. Slowly stir in the soy milk, then turn the heat to low. Simmer at low heat for 10 minutes. Stir the shredded vegan cheese into the soup until melted. Pour as much of the tomato sauce into the pasta as desired; stir to combine. You will have a little left over, which can be pour on individual servings if eater desires. With Roburrito’s, Chipotle and Qdoba in the community, you can’t go wrong finding a burrito that is both vegan and hearty. Both places offer a style of burrito called a Mission burrito or San Francisco burrito — so named because it first became popular in the 1960s in the Mission district of San Francisco. The greatest part of this burrito? It is customizable. A few items are considered staples: a large, flour tortilla, rice, beans and salsa. There also can be a filling, such as a meat, fish, soy meat or potato, and then other add-ins such as sour cream, cheese, avocado or guacamole. Obviously, because I am vegan, there is no animal products or by-products. The burrito is still yummy and filling. Traditionally it is wrapped in tinfoil and eaten right from there, peeling the layer back as you eat. However, since the homemade burritos are fresh, cut the foil and begin the feast! 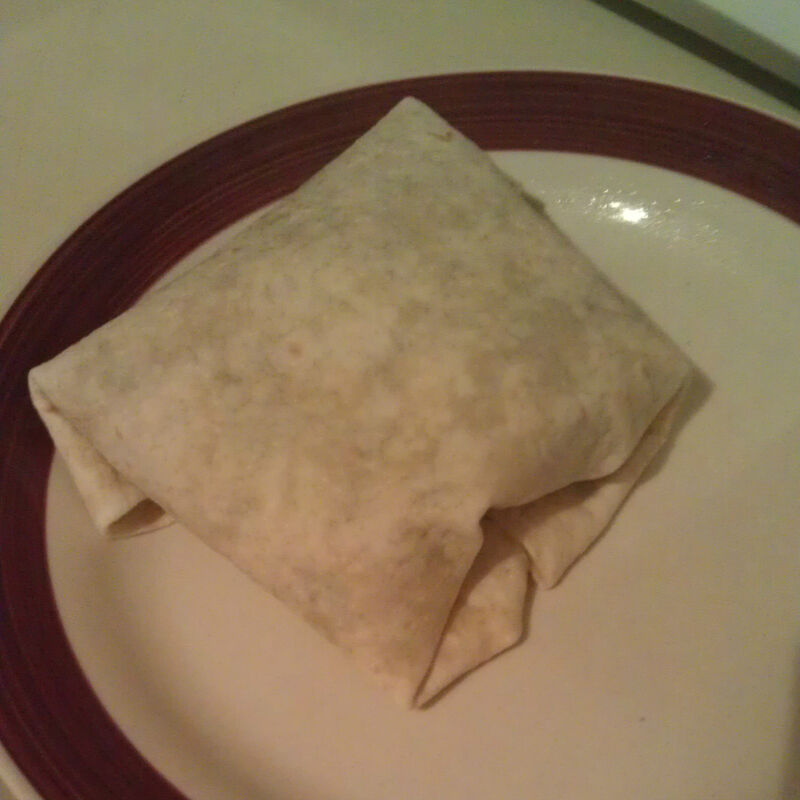 Plus, I seriously can’t fold a burrito correctly, so I just scarfed these up quickly. 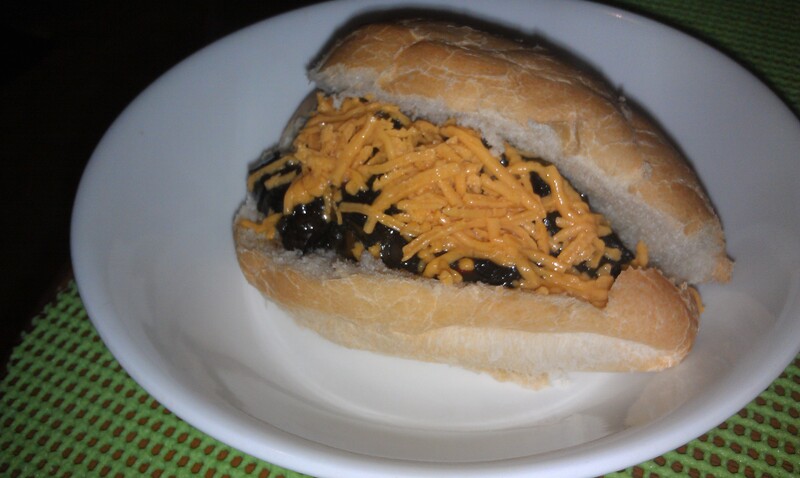 A can of black beans and a cup of brown rice can probably make up to 5 Mission burritos. Cook the rice according to the package. It took me 10 minutes to boil the water, and 10 minutes to cook the rice. Drain and rinse black beans. Place them in a bowl and heat in the microwave for 15 seconds. 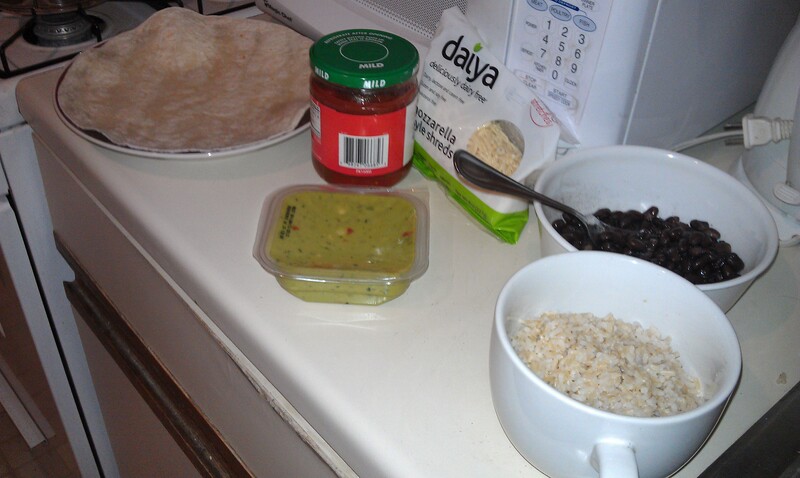 Set up your station: Rice in one bowl, beans in another; guacamole, cheese and salsa opened and ready. Put one tortilla on a plate and place in the microwave for 15 seconds. It makes the tortilla softer and easier to work with. If you have a tortilla steamer, use that instead. Place close to 1/3 cup of rice in the middle of the tortilla. Place 1/4 cup of beans on top, then 1 heaping tablespoon of guacamole and salsa. Add about 1/8 cup of cheese. Roll: Fold one side over the center until the filling is two-thirds covered. Tuck in the left and right sides. Roll the covered filling toward the last open side until the burrito is completely covered and rolled. Enjoy! It might be a little messy, but worth it. Check out these other 50 States, 50 Vegan Dishes posts. Delaware has a special place in my heart. My family would vacation in Delaware (Bethany Beach!) often when I was growing up. We stayed in Ocean City, Md., quite a few times, but I remember the first time we stayed at Bethany Beach at a condo complex. It was pure bliss for me. I miss going down there, and I am hopefully planning a trip for this summer. Delaware, like any coastal city, is known for its seafood. This is why I chose crab puffs for this state. When I made this dish, it was for a Thirty-One party I had in January. I didn’t have a lot of time to create these crab puffs, and if you wanted them to look more like hushpuppies, that wouldn’t fly. (Hushpuppies remind me of Long John Silver’s!) Then I stumbled upon this recipe by Pillsbury and rejoiced. Many of Pillsbury’s products are vegan friendly, which is helpful for making a last-minute pizza or finger food for a party. These cute little puffs can be a great dish for dinner, paired with a fresh salad or sauteed veggies. It only dirtied two bowls and a cookie tray, and took about 30 minutes to make. If using fake egg, follow directions on the container and make one egg. (I usedVegg, which gave the dish an eggy flavor. But it is not needed to keep the filling together.) Add Vegenaise to the bowl and mix. Pour egg/mayo mixture into chickpea mixture. Stir. Add chopped tomato, green onions and vegan cheddar cheese. Stir until incorporated. Set the bowl aside. Heat oven to 375°F. In small bowl, mix melted butter. Wipe your cookie pan with oil or use a vegan nonstick cooking spray. 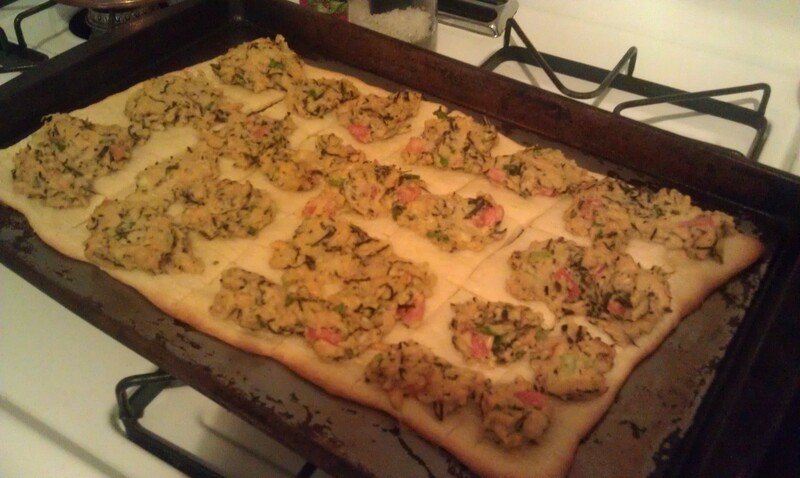 If using dough sheet: Unroll dough on sheet; press into 12×8-inch rectangle. If using crescent rolls: Unroll dough on sheet; press into 12×8-inch rectangle, firmly press perforations to seal. Cut into 2-inch squares. Brush with butter. Bake 4 to 6 minutes or until puffed. Take out and let cool for 1 minute. Spoon a generous tablespoon of chickpea mixture on each square. Bake 10 to 12 minutes longer or until golden brown and tops are set. Serve warm. See other 50 States, 50 Vegan Dishes recipes. 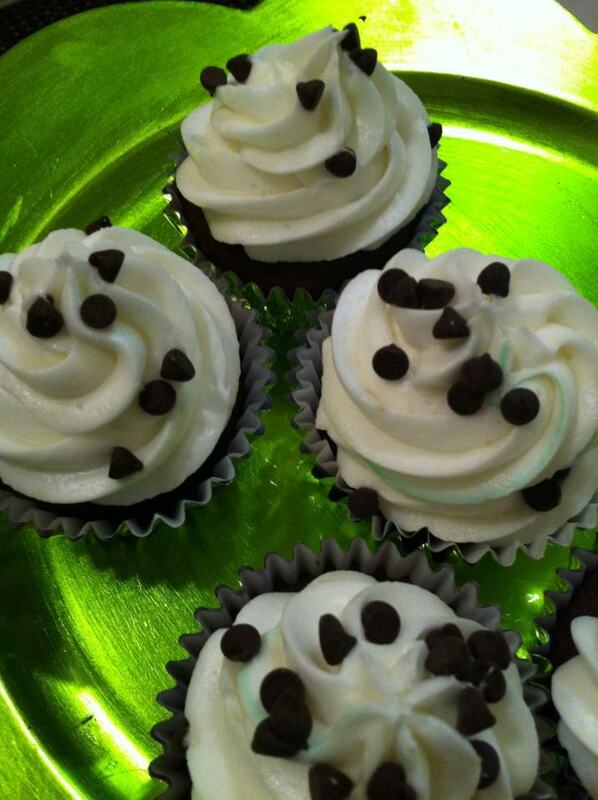 Vegan cupcakes from Ladybug Baking Co.
Thing No. 1 — I’m back! Yes, I know, I am a horrible blogging person. I abandoned all of you. You see, I blog. A lot. You might not notice it, but if you went to Yorkblog.com (specifically Twenty & Change, Book Buzz, No Sweat, York, and Smart Magazine), you would see my blogs up there weekly, for most of them. I do a Meatout Mondays post, a Comic Book Wednesday post and a green living post on Thursdays. 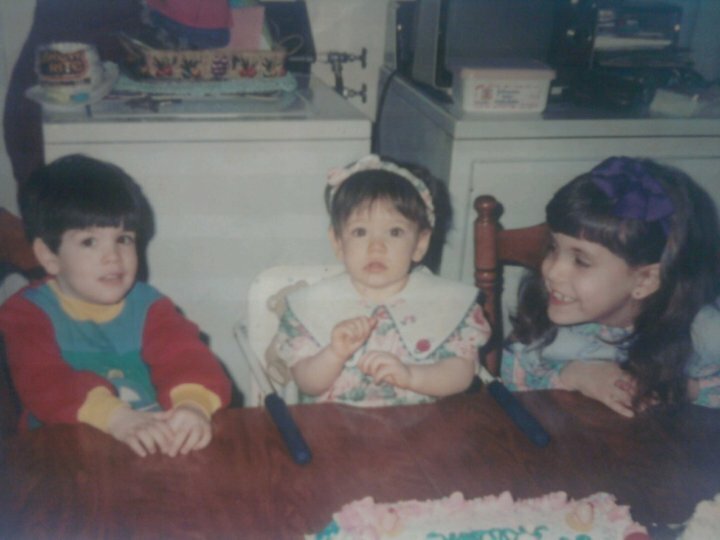 I try to write about living life in my 20s, but I am quite boring. Which led me to abandon Wonder Vegan, because I am just boring. Sorry. But now I am back, and I am going to try and make this blog useful. Will you still follow me? Thing No. 2 — The monthly vegan meetup was this week. We met Tuesday at Ladybug Baking Company and Cafe on Beaver Street in York. Jessica, the owner, was kind enough to open her shop outside of normal business hours so we could meet and enjoy vegan, yummy food here in York. A big THANK YOU to Jessica for hosting us! Next month we hope to do a potluck again, but we will see. Details are being finalized. The baby sister is finishing up her second year at college and looking for a summer job. It is the mad dash time of year, which is something I haven’t experienced in a few years. I hope you will join me again and read my posts. I welcome suggestions!